Blueberries are perennial flowering plants and members of the Ericaceae family which also includes cranberries and rhododendrons. Azaleas are also from the same family so if Azaleas grow well in your area, it's all good news for you! Most productive cultivars originate from North American stock, where they grow naturally from Canada to southern USA. 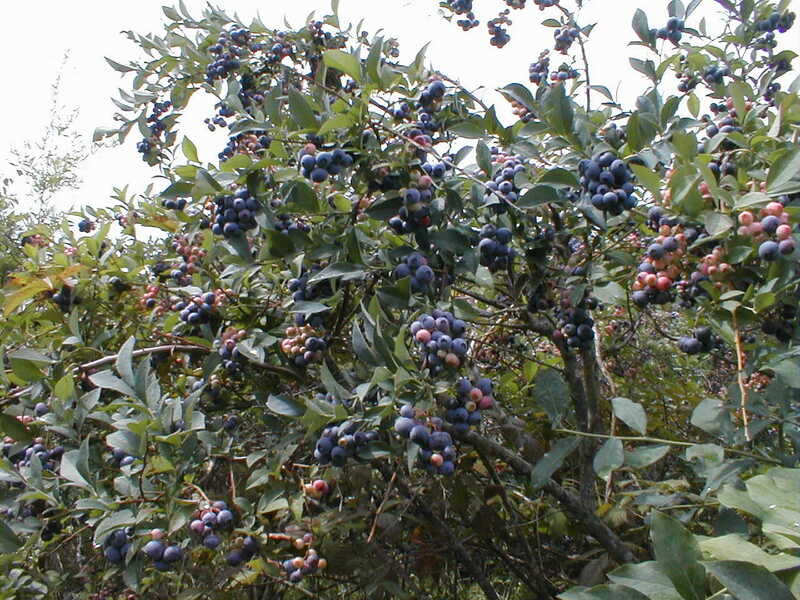 If left untrimmed blueberries shrubs can grow to around 2 metres. The berries grow in clusters and range in size from a pea to a small marble and the berries do not all ripen at the same time on the branch. It has to be remembered that blueberries don't continue to ripen once picked, so it's best to leave them until they are very ripe before harvesting. To date, ALL commercial blueberries are harvested by hand - there is ongoing research on how to mechanically remove only the ripe blueberries without damaging any green ones. Landline did an interesting segment in Oct 2016 and can be seen at the following link: http://www.abc.net.au/landline/content/2016/s4561592.htm. 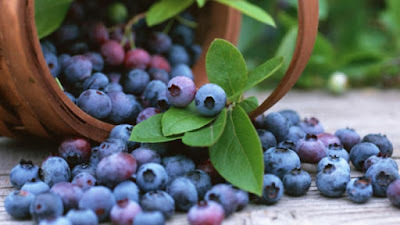 The blueberry is the most famous (and tasty) berry in the Ericaceae vaccinium genus. Others include the bilberry, cranberry and ligonberry. There are others which may be very unfamiliar to us here on the Coffs Coast - sparkleberry, farkleberry, whortleberry and partridgeberry, I kid you not!! Growing blueberries does require some patience as it is best to let them establish first - this means you pluck off any flowers in the first two springs so the bush doesn't set fruit. By the third year you can let it flower and set fruit. By the time your shrub is around 8 years old it will be producing up to 7 kilograms of fruit - you may not get to eat all those fruits though, as birds like them just as much as we do! Bare-rooted plants are less likely to suffer from transplant shock and are available between late autumn and spring. A sunny position, moist soil, (with a pH between 4.5 to 5.5) with very good drainage with the topsoil enriched with lots of organic material eg cocopeat. It is suggested that if your soil pH is not within that range you will have to add either elemental sulphur (where the pH is too alkaline) or lime/dolomite (where the pH is too acid). If the soil pH is high the plants may show signs of iron deficiency. Potted blueberries are also available and often folk find the soil requirements easier to control. If you do opt to grow in a pot purchase more than one to assist with successful pollination. Plant potted stock as soon as they're removed from pots - the roots dry quickly and recover slowly. Create a planting hole about 15cm wider and deeper than the root system. Water well after planting and connect a dripper to the base of each plant to ensure thorough watering, resulting in plentiful fruit. Blueberries are shallow-rooted shrubs with fine, fibrous, surface-feeding roots. All commercial blueberry farms use drip irrigation so they are grown down slopes to assist with water flow. If you have poor drainage, it is suggested that they are grown in a raised bed or on a mound of soil with the use of lots of mulch. The Rabbiteye, a late season variety, is one of the best at coping with our warm and humid summers and tolerates dry conditions during the winter, making it just right for the Coffs Coast. This variety's name comes about because during the ripening stage when the blueberry is pink, if you look closely you will notice the calyx appears to be little rabbit eye looking right back at you. 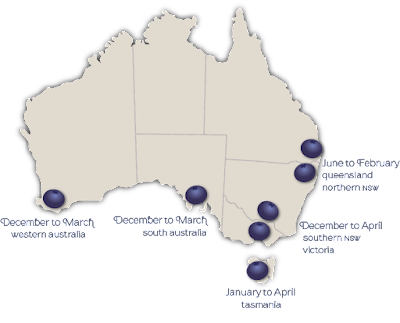 Also grown in Australia are Highbush blueberries - this is the most common variety in Australia, with many cultivars suited to the Australian climate. The two most popular cultivars grown here are the Northern Highbush and the Southern Highbush. 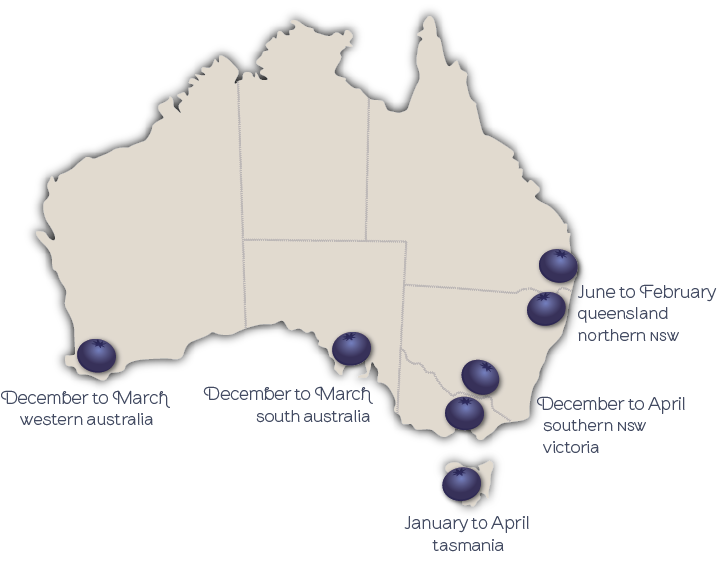 Just to add confusion, the Northern Highbush is grown in Victoria, Tasmania and Southern NSW, while the Southern Highbush is grown in milder regions like Coffs and southern Qld. Pruning helps productivity and while the aim is to create a vase-shaped bush with an open centre (to prevent fungal disease), blueberries also make a great hedge. Remove any weak, dead or crossed branches at any time of the year. Tip-prune shoots back by one third during early spring and remove unproductive shoots close to the base that are two or more years old. This hard prune encourages suckering and the formation of more shoots. Individual fruit will most likely ripen at different stages from December to mid-January (depending on variety and location). Fruit starts hard and green, softening as it ripens, attaining its distinctive blue-black colour with a coating of white bloom. Once the fruits are fully darkened, taste a few before harvesting. Blueberries do not get any sweeter after picking so it would be a shame to pick them too early. Full sweetness takes a week or so beyond full colour to develop and timing varies between cultivars. Such a good information about Blueberries. Thank you for sharing it. Pleased you got something out of this post. We should all have blueberries in our gardens.